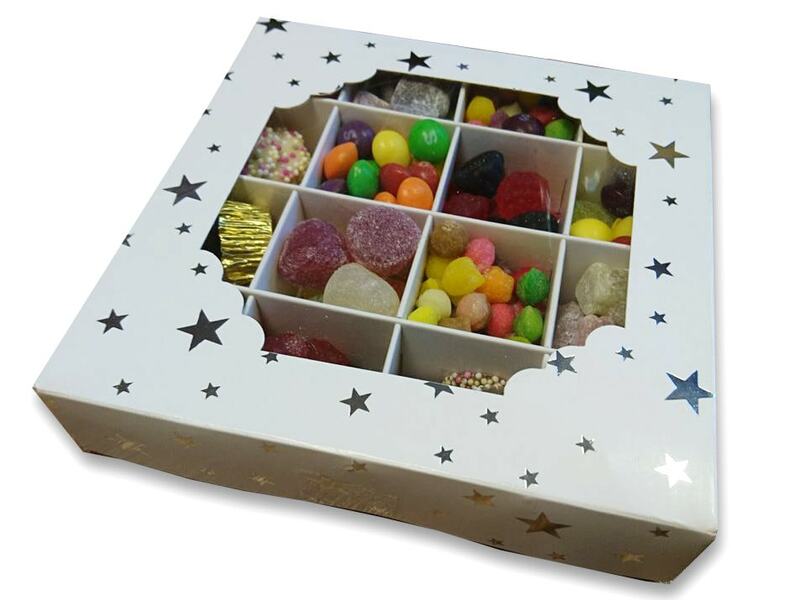 At times we may be out of stock of a particular sweet (not often), when this is the case we will include a suitable substitute of the same of greater taste & quality. 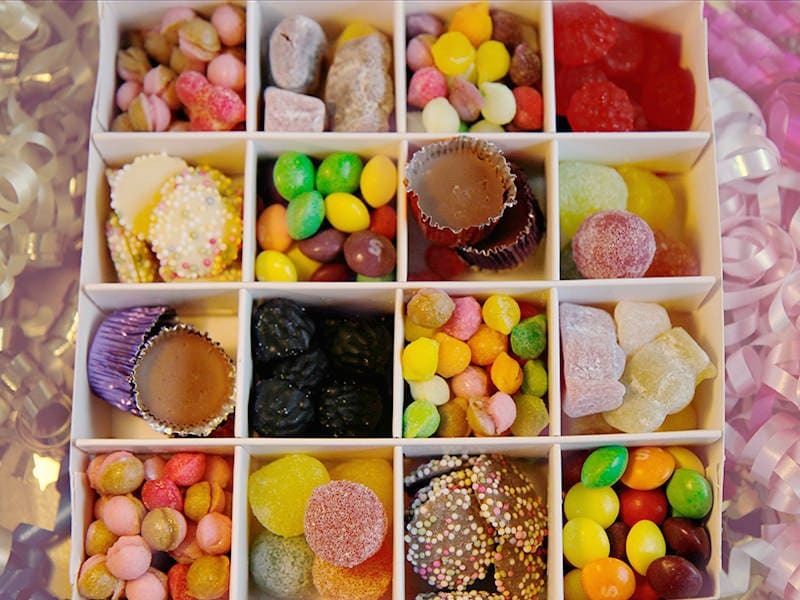 Jelly Babies: Sugar, Glucose Syrup, Water, Beef Gelatine, Cornflour, Citric Acid, Flavourings, Colours (Anthocyanins, Curcumin, Paprika Extract, Chlorophylls), Plant Concentrates (Safflower, Spirulina). 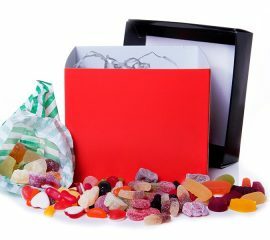 Black & Red Gums: Glucose Syrup, Sugar, Modified Maize Starch, Pork Gelatine, Acid: Lactic Acid; Citric Acid; Flavourings, Vegetable Oils (Coconut), Colours: E120, E153; Glazing Agent: Carnauba Wax. Skittles: Sugar, Glucose Syrup, Palm Fats, Acids; Citric Acid, Malic Acid; Dextrin, Maltodextrin, Flavourings, Colours E162, E171, E100, E160a, E132, E133, E163, E160e; Modified Starch, Acidity Regulator Trisodium Citrate, Glazing Agent Carnauba Wax. 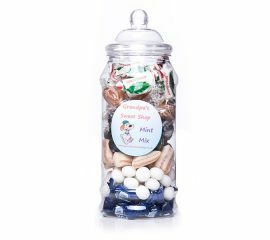 Icy Cups: Sugar, Partially Hydrogenated Vegetable Oil (Coconut, Palm Kernel), Sweet Whey Powder (from Milk), Cocoa Powder, Soybean Flour, Emulsifier: Soya Lecithin; Hazelnut Paste, Natural Flavourings. 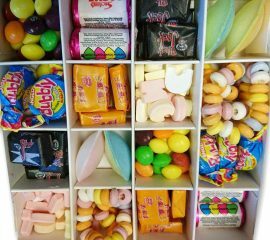 For those of us that love jelly sweets this is most definately the hamper to have - 10 different jelly and gum sweets weighing an amazing 1kg (probably even more!!) You can't go wrong with this one, the hampers itself is 17.5cm x 17.5cm x 15cm and filled to the brim with a whole array to choose from and then finished with a nice ribbon - its one of our favourites! 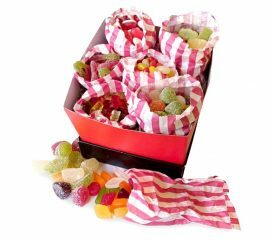 This hamper contains: 150g x Wine Gums 150g x Jelly Babies 150g x Fizzy Cola Bottles 150g x Sour Cherries 150g x Jelly Beans 150g x Heart Throbs 150g x Fruit Jellies 150g x American Hard Gums 150g x Black & Red Gums 150g x Goldbears At times we may be out of stock of a particular sweet (not often), when this is the case we will include a suitable substitute of the same great taste and quality! Feeling fruity??! 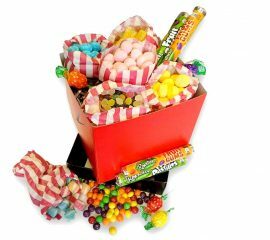 Then this hampers for you full of all those wonderful fruity flavours and bright colours thst bring a smile to everyone's face... 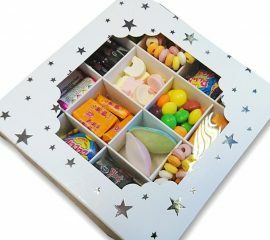 The hamper measures 17.5cm x 17.5cm x 15cm and is finished off with a bow - making a perfect gift! 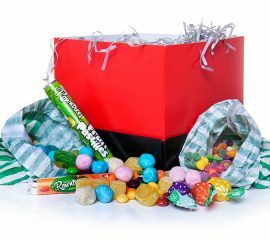 This hamper contains: 100g x Blue Raspberry Bonbons 100g x Pineapple Cubes 100g x Skittles 2 x Tubes Rowntree's Fruit Pastilles 2 x Tubes Rowntree's Hard Gums 100g x Strawberry Bonbons 100g x Fruit Pips 100g x Lemon Bonbons 4 x Fruity Pop Lollies 100g x Tooty Fruity Cubes At times we may be out of stock of a particular sweet (not often), when this is the case we will include a suitable substitute of the same great taste and quality!